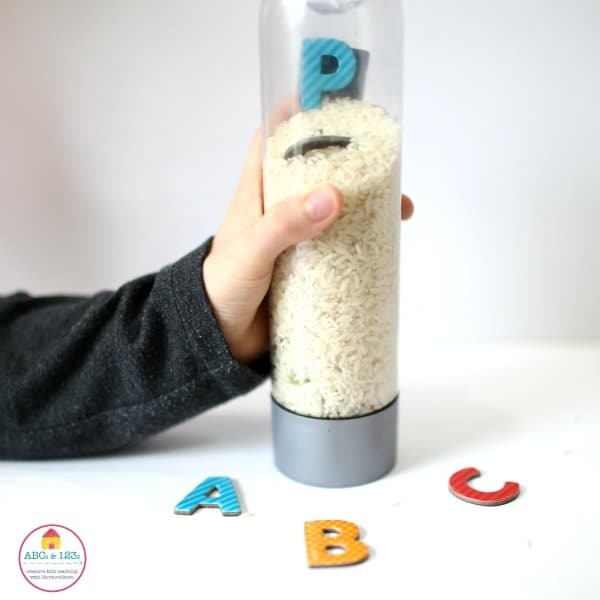 Dayna from Lemon Lime Adventures joins our ABCs and 123s letter and math activities series today with this super idea for a magnetic alphabet I-spy bottle. I-spy bottles are popping up everywhere you look nowadays, and for good reason. I-spy bottles are a simple and fun way to give children sensory experiences as well as practice beginning concepts. 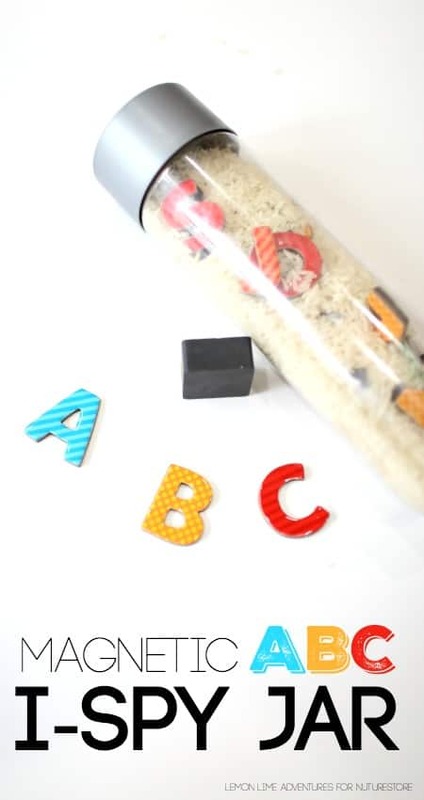 This super simple magnetic ABC I-spy is great for helping children practice letter identification. 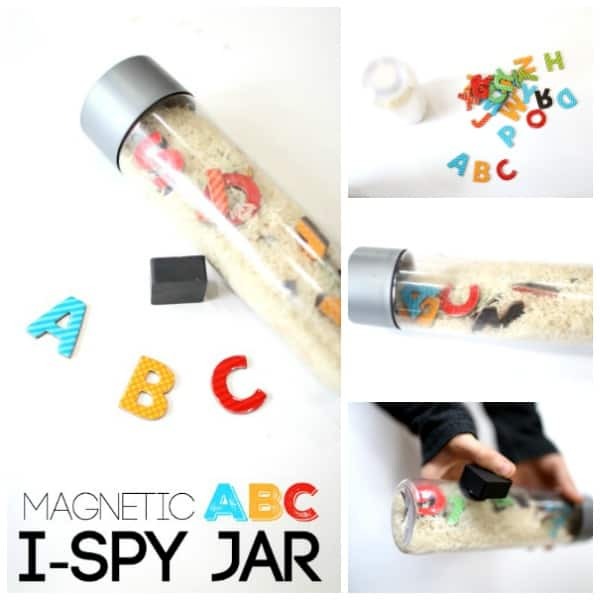 Making your magnetic I-spy jar is pretty simple. We love sensory bottles around here and find ourselves making one for almost every occasion from calm down jars to fun galaxy-in-a-jar experiments. This sensory bottle is one of the easiest ones to make. Start by adding in your rice through a funnel a little at a time. As you fill your bottle, begin to add in your magnetic letters mixed in. This makes them easier to evenly disperse later on. Keep filling your bottle until it is about 3/4 of the way full. Tip: If you have a toddler or a child that likes to take things apart… I highly recommend using hot glue to close the jars. Now that your I-spy bottle is made, it’s time to play. Have your child use the magnet to “capture” their favorite letters, the letters in their names, or even letters with straight lines. The possibilities are endless. The Ultimate List of Sensory Bottle Materials – Are you ever lost and not sure what to add to your sensory bottles? This post has a list of tons of sensory materials you can use next time you go to make an I-spy bottle or sensory bottle. All of these would make perfect alphabet play ideas. DIY Letter Building – Your kids will love making letters with this hands-on game. 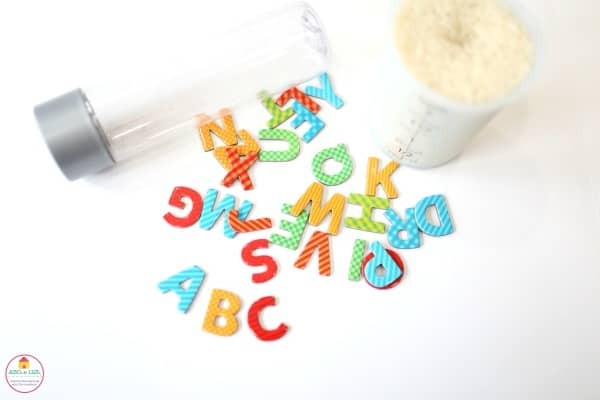 Using straws and pipe cleaners, your kids can practice making all of their favorite alphabet letters. 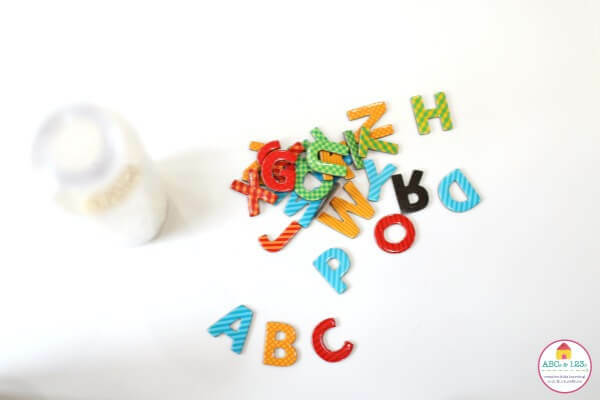 Icy Alphabet I-spy – This is the perfect I-spy sensory game to play for additional sensory input when the weather is warm outside. Dayna is the owner, writer and founder of Lemon Lime Adventures, where she shares tips and real life advice on how to embrace all of life’s imperfect moments. She also is the cofounder of Project Sensory, with her husband, where they work together to spread awareness and supply simple tools to solve everyday sensory struggles. Dayna is the co-author of the best selling book, Sensory Processing 101. I’m really late to this party, but I just saw this post and wanted to add my 2-cents! I’ve used VOSS water bottles that you can get at most large grocery stores. The opening is larger than most others and the label is easy to remove. Also, I found a good tip online that a mixture of coconut oil (in its solid state) and baking soda removes the stubborn glue/label from any container. Just give it a good coating, let it sit for a while, then wash well with hot water and soap. Sometimes you need to do a second application, but I’ve never seen a bottle or jar it wouldn’t clean. I just keep a container of the mixture in the kitchen all the time. Hope that helps. Great tips Janice – thanks! Thanks for the lovely feedback Sangeeta!